Stocking stuffing, for me, used to be going to CVS and buying a bunch of nail polish. Not anymore. 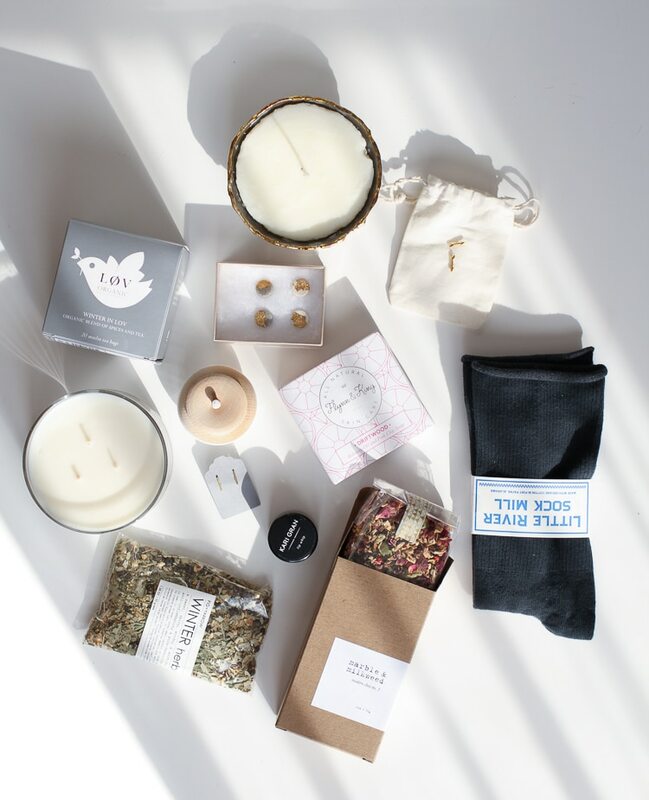 When a lot of sustainable and artisan items are out of reach, price wise, stocking stuffers are the perfect way to support makers or organic food and eco-friendly jewelry, while making your recipients squeal with delight – even if you don’t have a ton of cash to spend. 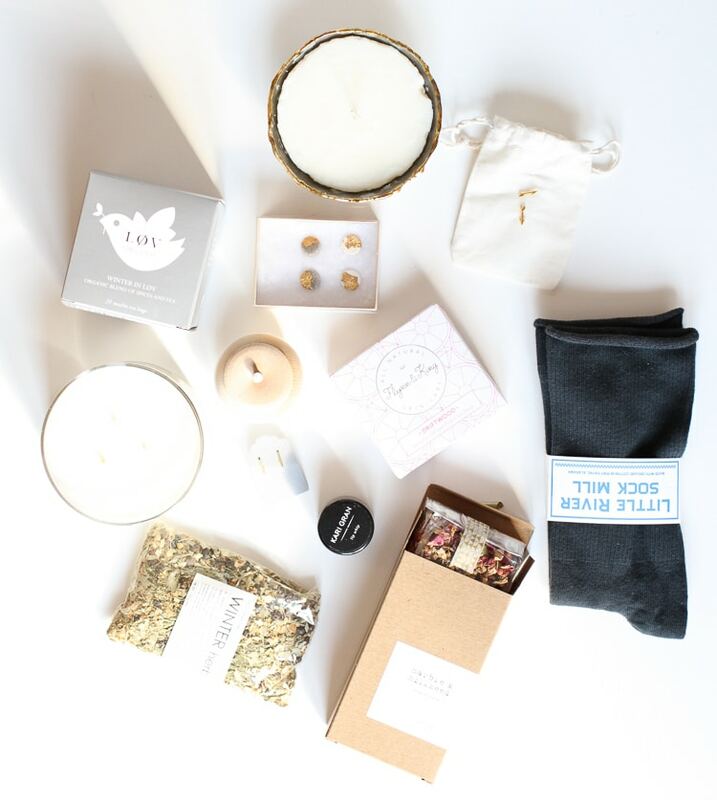 To help you stuff like a sustainable pro, I gathered up pretty little things from my favorite sustainable and ethical retailers – one for ladies, and one for men. 1. Wabi Sabi Diya candle, Indelust. 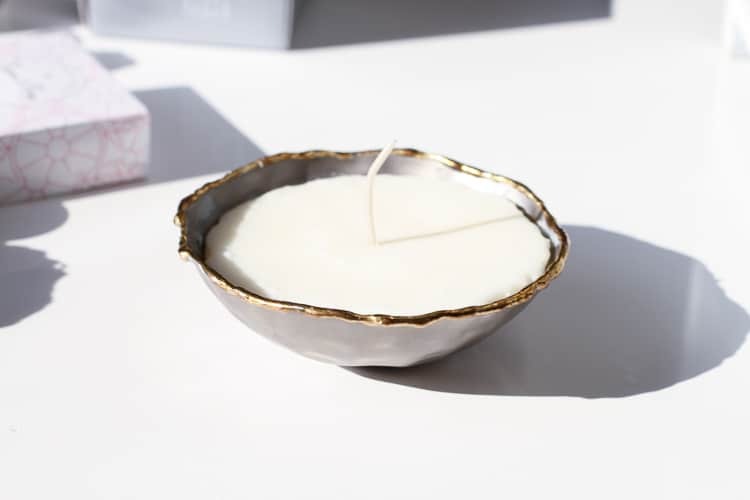 A luxurious floral candle set in a metal, reusable diya with delicate, powdery hints of magnolia, jasmine and lemon. Handmade with non-toxic and biodegradable natural soy wax, infused with natural essential oils, and it comes pre-wrapped for you! 3. Løv Organic Winter Tea, ABC Home. In Scandinavian countries ‘løv’ means ‘leaf.’ Løv Organic embraces the environment to produce its lovely organic tea, with reusable (beautiful) packaging. 4. Real Gold Leaf Minimalist Polymer Clay Stud Earrings, EcoHabitude. Handmade in small batches in New York, and only $8 per pair! 5. Sparkling Treasure Pot, Madesmith. 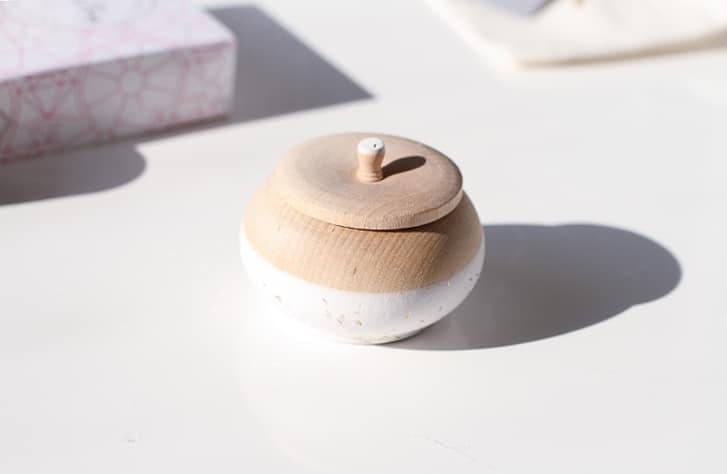 This Mini Treasure Pot has been hand dipped by Wind & Willow, and only costs $9! 6. Flynn & King driftwood soap, Ethica. Ethica debuted its new beauty shop just a few weeks ago, and the new brand Flynn & King is included in there. This all-natural Driftwood soap balances all skin types. Babassu oil, pink kaolin clay and ruby-red grapefruit essential oils gently cleanse and exfoliate, while Texas cedarwood acts as an eco-friendly insect repellent. Flynn & King donates $1 from every Driftwood soap sale to I’m From Driftwood, a nonprofit devoted to spreading acceptance for members of the LGBTQ community. 7. Little River Sock Mill Slouch Sock, Zady. Based in Fort Payne, Alabama, what was once the capital of sock production in the US, this second generation, family-run sock company crafts socks from American grown and spun organic cotton and low impact dyes. 8. ‘Twas the Scent Before Christmas Three-Wick Wearable Candle, EcoHabitude. Vegan, non-toxic, and handmade in California, you can dip into the wax of this candle and use it as massage oil as well! 9. 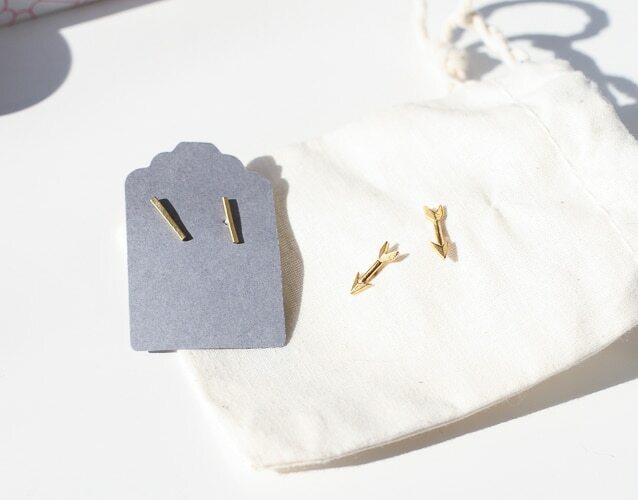 Cuyler Hovey King Brass Minimal Line Stud Earrings, Kaight. 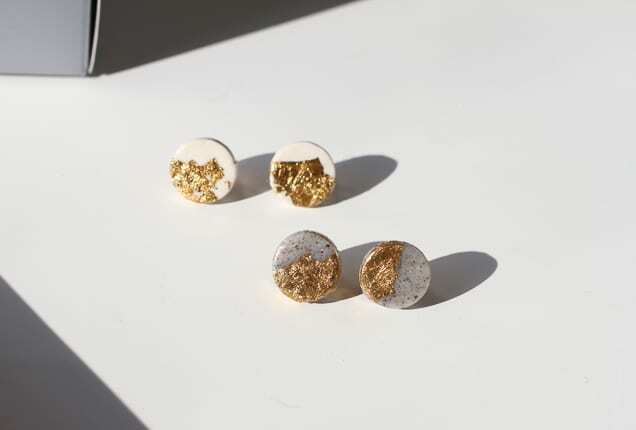 These simple studs are handcrafted in the U.S.A. out of hammered brass with sterling silver posts and backs. 10. Kari Gran Peppermint Tinted Lip Whip, Credo. 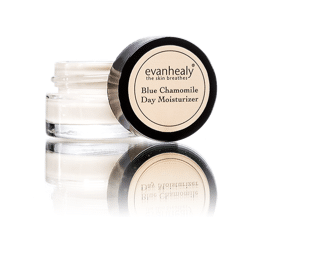 A perfect everyday lip balm, the Lip Whip contains a soothing combination of organic ingredients. It’s beautiful alone or paired with lipstick and gives lips a sensual, glossy, moisturizing boost. 11. Marble & Milkweed, Modern Chai No. 1, Madesmith. Organic, fairly-traded assam tea from India forms the base of this house blend, while organic cardamom & rose petals lend a spicy, floral note. Organic ceylon cinnamon, organic pink peppercorns, organic ginger and organic south Indian vanilla round off a melange that is as lovely to look at as to drink during the holidays. 12. Fig + Yarrow Winter Herbal Steam Blend. Purify, soothe and nourish your skin with all-natural facial steam. Natural herbal blend transforms to a nourishing steam that deep-cleans pores and leaves you with a healthy glow that lasts. Simply place in a bowl, add hot water, create a steam tent with a towel and breath it all in. 1. Raven + Lily Handmilled Chai Spice Soap. This hand-milled soap smells of cinnamon bark and nutmeg, infused with essential oils and herbs. These ingredients combine with spring water to form the soap bar that is a sweet and savory holiday treat. 2. Slate State Bottle Stopper, Uncommon Goods.Steven Chavez and Justin English make these bottle stoppers out of natural slate. Use a piece of chalk to label your bottle, write a party-themed cheer, a note of praise for man or woman of the hour. Made in Denver, Colorado. All 50 states available! 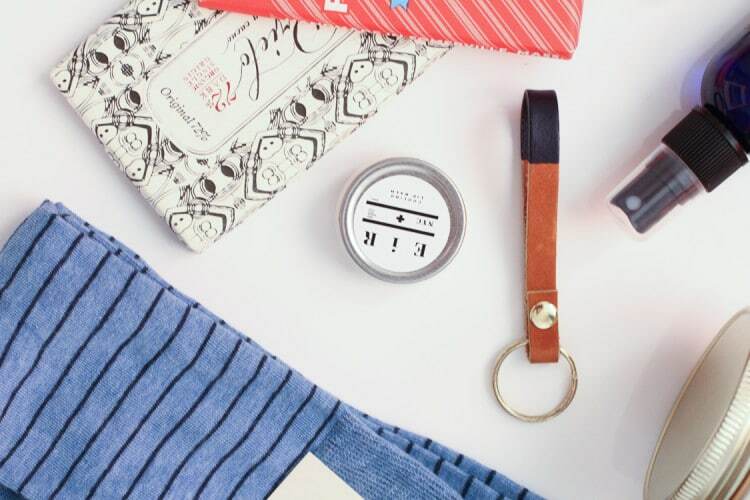 Check out the rest of Uncommon Goods’ stocking stuffers here. 3. Otis and Eleanor Bamboo Earbuds, EcoHabitude. Quality sound, 100% natural bamboo ear pieces, and they come with standard hemp cord that never tangles. 4. Etiquette Clothiers Needle Stripe Socks, Zady. While the Needle Stripe Socks were designed in New York, they were manufactured in small, family-owned factory in Italy that has been operating for decades. These socks were individually constructed on a 200-needle knitting machine using a combed cotton-blend, allowing the fiber to be extra fine and soft while remaining durable and taught. 5. Hi Wildflower Botanica Sweet Tobacco Candle, Madesmith. 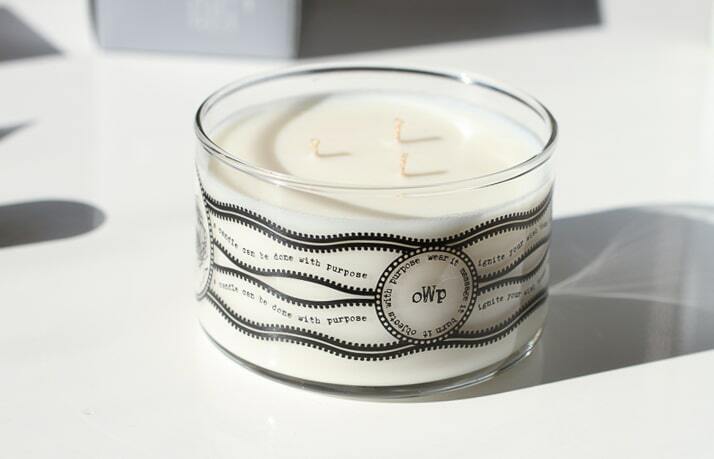 Hand-poured in Brooklyn, this candle has notes of dried tobacco, Moroccan oud, and black pepper. 6. Graydon The Mist hand sanitizer, Credo Beauty. The Mist will solve many of your (and your dude’s) cleansing dilemmas, such as dirty/sticky hands, odors in your car/washroom, and gym bags! The active ingredients in this formulation are potent (but non toxic) germ exterminators. 7. Glass Straws, Uncommon Goods. A reusable alternative to disposable plastic straws, these are designed and made by dentists in California to be better for your teeth than plastic straws. The set includes one straight straw, one angled straw, and a special brush to keep them clean so they can be used over and over. 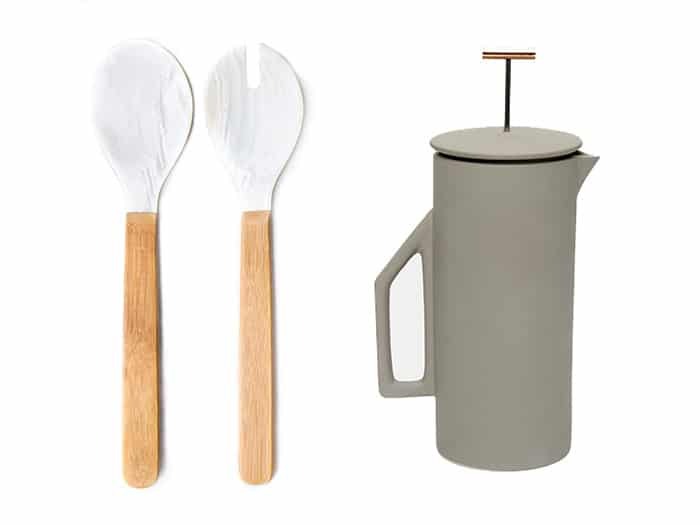 They’re made from borosilicate glass tubing that’s hand shaped, flame polished, and annealed to produce finely-crafted, waste-saving alternatives to disposable straws. 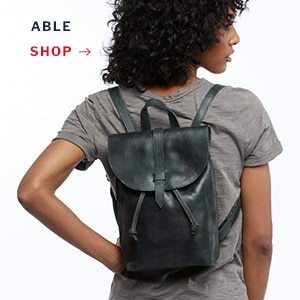 See more gifts under $25 here. 8. Catskill Provisions Raw Wildflower Honey, ABCMKT. 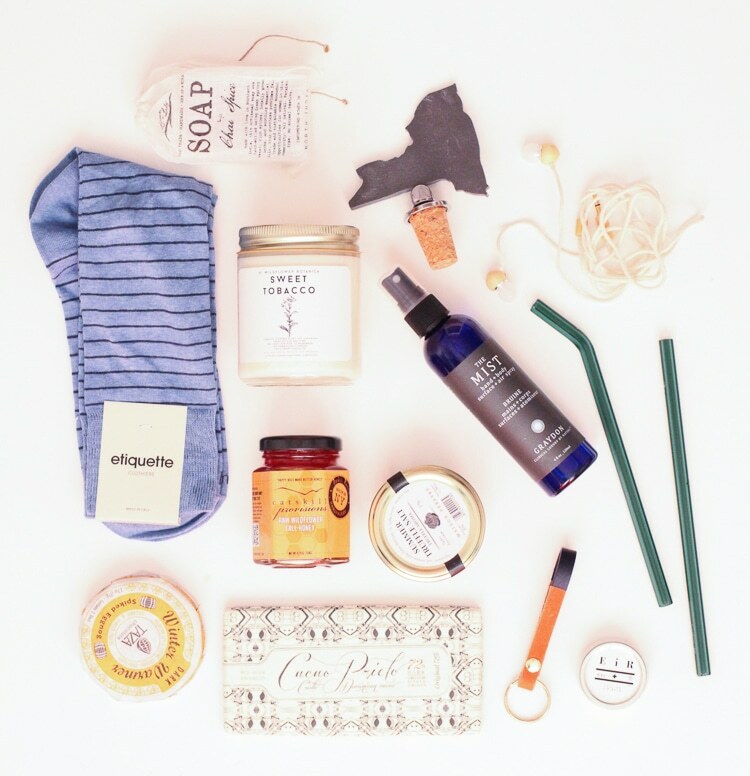 Located in a small corner of the Northwest Catskill Mountains, Catskill Provisions specializes in creating raw, all-natural, handmade products. 9. Maison Pébeyre Truffle Salt, EcoHabitude. Season risotto and french fries with these pieces of truffle in wild-harvested salt from Italy, or use in cooking instead of salt and truffle oil. 10. Son of a Sailor Leather Key Fob, Zady. The classic leather key fob is made from American leather with solid brass rivet and key ring. Painted by hand in the Son of the Sailor studio in Austin, Texas. 11. Organic Spiked Eggnog Chocolate, Rodale’s. This intensely rich, chocolate is made in hand-carved granite millstones, allowing the bright flavors of premium ingredients to be preserved and leaving addictive rustic textures in the finished discs. Serve the chocolate on its own, or melt it down to make ridiculously good Mexican-style hot chocolate. 12. Cocao Prieto Organic Criollo Chocolate Bar, ABCMKT. Organic, kosher, and locally made in Brooklyn, this chocolate honors the sustainable methods of the Prieto family farm in the Dominican Republic. A haven of biodiversity and preservation, the farm produces beans that are genetically linked to the original criollo cocoa beans Christopher Columbus brought to the island. 13. EIR Cooling Lip Balm, EcoHabitude. Handmade in Brooklyn, EIR is an organic skincare line that uses elixirs of essential oils and natural herbs to nourish the skin while protecting and healing it. It’s cruelty-free, with no chemicals, no fragrances, no preservatives, no parabens.